Today, July 7, 2009, Hannah (a student in the Heidelberg University archaeological field school) discovered this hard rubber ring in the 1862-1863 prison hospital latrine. 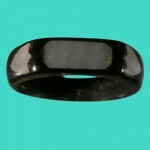 The ring is made from hard rubber, first patented in 1851. Prisoners made this jewelry to send to their families, friends, and to sell to fellow prisoners. Several prisoners were well known for their expertise in working with hard rubber. This particular ring is unique in that it has two sets made with shell (the side shield sets) and one center set made from stone. As can be seen, hard rubber jewelry withstands being buried with little or no deterioration. This ring represents one of the archaeologically significant aspects of this site. Over the years, we have recovered evidence of this hard rubber craft activity in almost every context. Even in the hospital we have evidence of their working with materials necessary for jewelry. The piece of shell noted as FS 8012 was discovered in the soils underneath Block 6, the prison hospital. 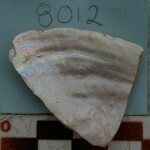 As you can see from the picture, a section of the shell was cut from the rest of the piece. The cut marks are very clear and undoubtedly this piece was lost by a prisoner saving it for use in such items as the ring above. We have recovered several pieces of hard rubber waste from the manufacturing of rings, brooches, and other trinkets. This entry was posted on Tuesday, July 7, 2009 at 8:19 pm	and is filed under Special Finds. You can follow any responses to this entry through the RSS 2.0 feed. Both comments and pings are currently closed. It was an incredible find! 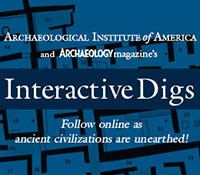 Sometimes artifacts are difficult to identify, but this ring was unmistakable. The man who lost must have been sad to see it go, but I must say, I was happy to find it! That’s a very nice find. Any idea what type of stone was used for the center set? We have not been able to determine yet what type of stone the center set is made from. It looks like it may be either marble or possibly a softer soap stone. Once we get our geologist to look at it, I will post the results. Way to go Hannah on a spectacular find! Could the stone in the ring possibly be mother of pearl or some type of lightly colored opal? Were those materials available to the POWs? I would imagine that the prisoners may have been able to find shell and stone in the compound, but where did the rubber come from? The hard rubber the prisoners used in their jewelry making typically came from either hard rubber buttons or chart rules (imagine a foot long ruler) which they may have bought from the sutler or had sent to them by friends. We have found lots of examples of hard rubber waste pieces, especially in our excavations of Block 4. When I have a minute, I will try to post a few examples. I wonder how it was cleaned? If it was founf ina latrine, did the bacteria die a long time ago? I imagine that it was soaked, but then the stones might fall out. All we needed to do to clean the ring was use water at first. Lime had attached to the hard rubber and set materials, so I used a bit of citric acid to clean that off. It still needs a bit of cleaning, but I wanted to wait till we were out of the field. Typically, we find hard rubber items with almost no deterioration problems. The sets are glued in using what I think is melted hard rubber. I have yet to see one fall out that was found archaeologically. Just the English teacher in me but the word unique is a superlative. A thing is unique or not unique. It cannot be very unique. Sometimes we get pretty excited when finds are made. You are right, but in the moment, unique just didn’t seem enough. However, maybe we can change it to very rare. It was only about a year ago that I learned the significance of a similar ring I have. It was said to be my great-grandmother’s wedding ring. It is hard rubber with silver inlaid rectangle, hand and heart on the sides. It’s possible that my great-grandfather made it, as he spent three years in northern prison camps during the Civil War. Here is a link to a photo of it.